PORT CHARLOTTE, Fla. – When Jake Odorizzi arrived to the Rays’ spring headquarters in February of 2013 following Tampa Bay’s trade of James Shields to Kansas City, he was summoned into a conference room at the Rays spring training facility, which rests in a rural and remote part of southwestern Florida. Present in a conference room were then-general manager Andrew Friedman and pitching coach Jim Hickey among others. Odorizzi remembered the meeting was informal and relaxed, but there was an important message presented, one Odorizzi had never heard in his professional career. “They said ‘We like what you do. We like your stuff,” Odorizzi recalled to FanGraphs in the Rays’ clubhouse last week. For years, Odorizzi had heard from coaches and others in the Kansas City and Milwaukee organizations that he needed to make significant changes to his pitching philosophy. Odorizzi felt his fastball played better in the upper reaches of the strike zone, but the Brewers, who selected Odorizzi with the 32nd overall pick in the 2008 draft, and later the Royals — where Odorizzi was traded as part of the package for Zack Greinke — informed Odorizzi he must pitch in the lower part of the zone. “When I was with Milwaukee early on, and with Kansas City in the lower minor levels, I was never really a lower-in-the-zone type of guy,” Odorizzi said. “When I was in Milwaukee, they kind of told me in a roundabout way ‘Well, if you don’t learn to pitch down in the zone, you’ll never make it to the big leagues.’ This was in 2008, 2009 which was, shoot, nearly 10 years ago. Pitching up in the zone consistently, purposefully, was unheard of. You pitch down in the zone, you get ground balls. I could pitch down in the zone, but I had more conviction when I did not consciously think about it and let [the fastball] do its own thing, let it take off a little bit. 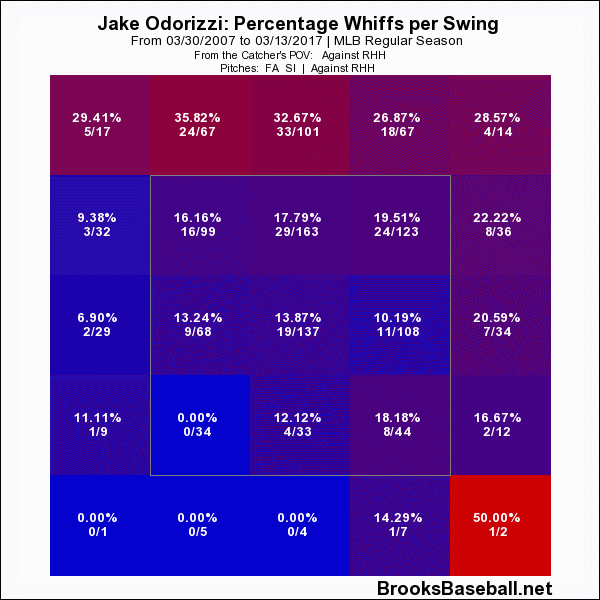 Odorizzi is an interesting pitcher at an interesting point in time. In recent years, the ground ball, and pitching down in the zone, has become more and more valued as shifts have increased dramatically and proliferated, as teams try and better avoid extra-base hits. The top five ground-ball seasons on record at FanGraphs have all been posted in the past five seasons. But the philosophy has become so common that hitters like Josh Donaldson and J.D. Martinez have begun to adjust and preach a get-the-ball-in-the-air philosophy, which can be an effective counter-punch to the popular two-seam pitching approach. Odorizzi’s skill set will perhaps become a model counter-measure if hitters are more and more focused on the lower part of strike zone. The lower third of the strike zone is where HR/FB rates exploded last season, as Jeff Sullivan recently observed. Sullivan also expertly covered the Rays’ fastball location last week. The Rays have a clear fastball preference. 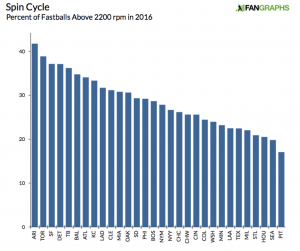 In addition to the location data Jeff presented, only three tams had more fastballs that produced an average rpm of 2400 or greater last season, a crucial factor in creating rise. And in 2016, the lower portion of the strike zone shrunk for the first time in the PITCHf/x era, according to Jon Roegele. It’s perhaps another reason to pitch up in the zone. While the Rays didn’t have an elite pitching staff last season — ranking 15th in MLB with 11.9 WAR from starting pitchers — and while they allowed the eighth-most home runs in the majors last season (137), they did finish fourth in infield fly-balls (115) and no team had more swing-and-miss on fastballs up in the zone last season. The Rays, always in search of market inefficiencies, have zagged when the game has zigged. 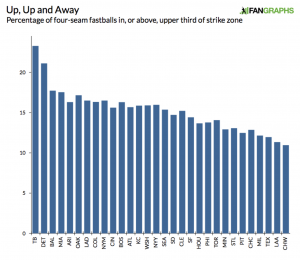 When the game began to devalue the four-seam fastball at the top of the zone, they began to value it. It is not all that shocking that a savvy, small-market team would operate in such a way, but this is not a story about the Rays’ leading baseball in elevated fastballs. This is a piece on why and how the Rays are compelling pitchers, particularly those whom they’ve acquired and not developed, to buy in to a philosophy that runs contrary to what many arms have been told since they were amateurs. With Odorizzi, the Rays started selling the right-hander on an elevated fastball-approach early in his time with the club. In fact, the pitch began on his first day with the club. Presentation is often key with players. The Rays, of course, have hard data. The Rays also could offer video evidence. Odorizzi notes the Rays don’t attempt to convince every pitcher to throw higher in the zone. A two-seam pitcher like Alex Cobb will not be approached regarding a conversion. But the Rays have made a point of identifying pitchers who can pitch up in the zone, but don’t maximize the strategy, and selling them on the idea once they enter their clubhouse. Odorizzi is one example. Drew Smyly is another. Perhaps a young arm like Jose De Leon represents another. Smyly’s story is similar to Odorizzi’s. After he was acquired via trade in the summer of 2014 in a package for David Price, he attended a meeting with front-office officials and Rays pitching coach Jim Hickey and was presented with information on why he ought to pitch more often up in the zone. In 2015 with the Rays, Smyly produced a career-best 20.7-point difference between his strikeout and walk rates (K-BB%) as a starting pitcher. In 2016, while Smyly was hurt by a double-digit homer rate from pitching up in the zone, he posted a 16% K-BB rate and a 2.0 WAR. Hickey says having “information, the cold hard facts” is incredibly important tools to sell a player on a change. Hickey said the Rays like to show the “damage done” in “different quadrants” of the strike zone. “[The high-strike approach] makes sense also because of the way hitters train for the most part. Hitters are, for the most part, they are down there,” said Hickey, making an uppercut swinging motion to meet an imaginary low pitch. Cobb said it’s the visibility of front-office personnel in the clubhouse, and the trust and relationships developed, that is key in allowing information-based ideas to flow on to the field. Cobb said, for instanced, that he feels comfortable sending a text to general manager Erik Neander when wanting to have a deeper understanding of how his stuff is playing. Beyond the data, Hickey likes to add a personal, real-time touch to emphasize teaching points. His sales pitch does not work with every arm. “David Price had all the ability in the world to do that and probably could have been even more productive,” Hickey said. But it has been effective with many arms. Cobb has seen pitchers first skeptical about the philosophy adopt, adhere and benefit. “There’s been a lot,” Cobb said of adopters. “There’s been guys, whether we got them through trades or guys we got that nobody wanted anymore, the Rays saw something in them and thought if they could get their hands around them and tell them their ideas — not change anything mechanically — just change their mindset on the mound and how their stuff plays. That has been tremendously success here. Odorizzi said the high-fastball is enhanced and complemented by certain breaking pitches. “[Smyly] has that curveball that’s big and slow and drops down in the zone,” Odorizzi noted. “When you have fastballs up and curveballs down it opens up a wide range that hitters have to look for. While having the secondary pitches is crucial, while data is important, while Hickey pointing out real-time examples is helpful, nothing accelerates buy-in like some early success, like some swing-and-miss up in the zone. We hoped you liked reading Tampa Bay’s Cult of the High Fastball by Travis Sawchik! Keep the Mike Trout references coming!